Until recent years, the question on the Chinese economy that left most audiences, even the best informed, silent and petrified, was: “what is China massively borrowing from abroad?” Since China is the world’s largest exporting nation and plays a key role in world trade, the best answers generally concerned “raw materials” (which are not borrowed but bought), or “polluting rights”. The right answer was hardly ever given: “China borrows abroad its means of payment”. Indeed, in its decisive modernization drive of the past 35 years, China has “thought about everything”, but was not able to “take care of everything”. For a long time, China failed to achieve the most difficult part, in its process of economic recovery, which is monetary independence. However, lack of independence does not mean lack of autonomy. For reasons which I will develop here, China has acted in the monetary domain somewhat as an “autonomous satellite”, but very differently from the rest of the world, by isolating its financial system from the convulsions in the rest of the world. But the era in which this attitude can prevail is coming to an end. The traumas of Chinese history have quite a simple “narrative” as the Americans say: “China was a major world power and lost that position because of the incompetence of its political system and the abuses imposed by foreigners.” These trauma were usually monetary, and they are a history lesson deeply ingrained in the minds of the people and their leaders. The last regime to be overthrown on the continent was that of Chiang Kai-shek, forced to step down for economic and monetary reasons (runaway inflation and unchecked currency devaluations), and the most recent shift in Chinese history (China’s loss of influence in the world), was due to the monometallic regime adopted in XIXth century. By basing its monetary system exclusively on the silver metal standard, China was hit very hard, just as the other countries which had made the same choice, by the loss of its value relative to gold, for reasons essentially foreign to the Chinese economy. The other trauma deeply embedded in the Chinese mentality, even though only partially transposable, is the “official” Chinese interpretation of the 1985 Plaza agreements and the increased “internationalization” of the yen. Chinese analysts believe that Japan, which had ferociously resisted using the yen and clung to its sovereignty, was partially stripped of it through subjugation to a system dominated by the United States, which forced Japan to open up its capital markets, to use its currency for trade, including for investment, and brought about a “pseudo” (or real) overvaluation of the Japanese currency, provoking a stunning revaluation of the yen whose value doubled in dollars in just over one year. The Chinese reading of that crisis is that the Japanese recession was caused by this phenomenon, and that China today must preserve at all costs the hard-fought gains against the world system of the last 35 years, by resisting any foreign assault. That being said, China’s dependency on the U.S. dollar until the past few years is directly counter to that fear, but was inevitable for a long time. To end that dependency means that China has to build a developed financial system, with access to an obstacle-free market and with no economic fragility vis-à-vis the banking system. However, strangely enough, China has not invented its own financial instruments so far. It is merely modernizing, “liberal style”, its stock markets and organizing unmediated financing systems (interest rate markets) by launching bond markets, etc., but the road remains long. The efforts required to reform the economy, prices, international trade as well as, it should be said, the convenience of using of a liquid, acknowledged currency, i.e., the dollar, have long postponed the idea of reforming the global financial system. However, as China acts in the long-term, it would have been wrong to think that the postponement meant that such a strong, ingrained idea had been dropped: that of the need to change the system. The 2008-2009 financial crisis increased the awareness that something needed to be done to get the system to change. In effect, during the first waves of the crisis, in 2007-2008, and at the first G20 summit meetings, China believed the time had come to invest in foreign financial systems, such as taking a share in the Royal Bank of Scotland, which turned into a disaster for China. From this, China learned the lesson that it might be drawn into a game where it would have no choice but to become ever more involved in a sick system. The turning point came on September 15, 2008, when Fannie Mae and Freddie Mac were nearly declared insolvent, following the Lehmann Brothers the dollar. China indicated its support by committing itself to remain an investor of reference, but in practice started “pulling out its marbles”. 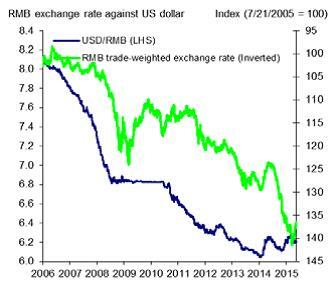 That shift is now playing out with a reduction of dollar-dominated Chinese assets, a diversification carried out when the best trade-offs could be made against currencies “good to buy” , because they were low against the dollar, and a halt to the increase in currency reserves held by the Chinese central bank. All this occurred finally in 2014. Chinese monetary policy remained unchanged between 1992 and 2005 in certain ways, at least as concerns the exchange rate, capped at 8.18 renminbi per US dollar until July 2005, when the daily fluctuation band was widened for the first time. This decision let the Chinese currency begin to revalue against the US dollar, as indicated here (Graphic, Source UBS Hong Kong). That decision, with its still noticeable consequences, was the beginning of a change which, as we now see, was well thought-out, slow and projected over time, since, ten years later, it has still not been successfully completed. After a “cautious” period of restabilization of the interest rate during “the crisis” (or better said, its most active phase), China took another measure in the summer of 2010: it partially opening its capital accounts via the Hong Kong “window”, a sort of twin to its domestic currency. Thus, it has created a “shadow” rate market. It remains to be seen whether this experience was a “liberal delusion”, an experience to be dropped if the results were not satisfactory, or an element of a disparate panoply. In any case, it was the most “liberal” façade of all the Chinese changes. — The first, based in part on the Summer 2010 decision to partially liberalize exchange of the yuan on the Honk Kong market, was the expansion of the use of the yuan for international trade agreements (bilateral and international, both for Chinese exports and imports, other than raw materials). Today, the yuan, which has swap agreements with some twenty countries including major powers, is the fifth most used currency in world trade, at some 5%, admittedly far behind the US dollar (40 % of all trade) and even the euro (10 %). — Second, the attempt to bring together similar, close, friendly countries, for example the “BRICS”, to anticipate a system of assistance and of possible pooling of liabilities and risks in a “BRICS bank”, envisaged at the Durban summit in 2011, which would allow them to forecast, soften and avoid crises “among themselves”, or even to create a parallel monetary system. Those two attempts have had a limited impact, but that does not draw into question Chinese theory and action. The main debate with the Western world concerns, in spite of the shadow play around the issue of “parity” (in reality a fake issue whose limits have been acknowledged, even by US financial players), the level of engagement and responsibility accepted by China. China’s position is understandable, even if it is not expressed objectively: the priority is development of its own economy, and no “global” responsibility could be raised against that constraint, because of the consequences it would have worldwide: a slowdown of the Chinese economy would mean an economic crisis for the rest of the world, which had anticipated its rising power. Far from the apparent debate on the exchange rate and the inclusion of the Chinese currency into the IMF’s Special Drawing Rights, the real issue for China is the validation of the global financial (IMF) “system as it is”, including a possible repositioning of China as a major player, or eventually as a “sparring partner” within a G2 format relationship with the US. The answer is deliberately ambiguous, as China insists on offering guarantees in view of a review of the SDR basket in 2015, and bases itself on the IMF’s recent opinion that the Chinese currency is actually not undervalued. One of the in-depth debates is also domestic, and in phase with the debate ongoing with the West: is the Chinese financial and monetary system “credible”, “reliable” and can it generate a “trust” in the original sense of the term, that is, a framework based on mutual trust? Considering the potential capital flight, hardly compensated lately by the accumulation of ever greater export related currency reserves, the answer is naturally negative. Above all, China has to give regain the trust of its own citizens. Its economic strength is not sufficient, because spoliation has been too frequent in Chinese history not to scare the “new rich” today (a class which includes the leaders or that they at least know very well). Yet a new spoliation threatens, as the country’s debt is no longer compensated by the perspective of a temporary stagnation in growth. Bankruptcies are emerging, the banking system has to be protected, and all of this cannot be done in the total openness that the West would like. — First of all, they had to control the financial bubbles created by a real estate market financed by black money or capital attracted for lack of other investment alternatives. — Second, they had to steer a sensitive monetary policy so the control of the monetary supply would avoid a “hard landing”. There were then increasing announcements of the partial opening of capital accounts, which was accelerated by the invention of sophisticated mechanisms allowing more rapid investments on the stock markets of Shanghai and Shenzhen. However, the issue was less to comply with international standards on open capital accounts, as the American Index MSCI pretended to believe, than to create an alternative to the drying up of investments via banks of the Chinese economy (over 200 % of GDP, public debt excluded). The motor of this opening was in fact the repatriation of “evaded” capital by stressing the risks of a possible collapse of the Chinese banking system in the event of a slowdown. China is, of course, not very transparent and wishes to remain, so especially in sensitive matters such as monetary issues. However, it is probable at this stage that China is keeping both options open: either progressively integrate the post Bretton Woods system with the risks long since largely identified and tested during the 2008 crisis, or invent cooperation with the glacis of dependent, sympathetic countries that share the same ambitions, a new regional and intraregional system, in any case international, but not global. That system could come out of the new Asian Infrastructure Investment Bank (AIIB), centered on China. Or, around the gas deals concluded with China, the possible first steps towards disconnecting trade in raw materials from the dollar market. In any case, the construction of a “renminbi zone” has begun. Does it aim at becoming at some point important enough to impose its rules (more or less fixed parity between currencies, indexations on underlying assets, or different standards than the dollar) or is it simply a means of protection against a parallel system that China distrusts, but uses its “liberal” mechanics (especially for its investments in Europe)? That remains an open question which the debate might help to answer. In the meantime, the Asian Infrastructure Investment Bank (AIIB) has created very great interest in Europe. China is interested in technology transfers in exchange for financing such infrastructure projects, and “non-recourse credit facilities”. The West could use that as a means of entering the relatively closed Chinese and Asian markets. But the AIIB could also become active in the future in Europe, where public capital for infrastructure might be lacking because of the deficits. And if such investments take the Chinese non convertible currency out of its relative isolation, the international monetary system might welcome the diversification of a game which has been dominated by the dollar until now.